The 1933 Sport Kings set is one of the most interesting sets produced in the 1930's. Bubble gum had largely replaced tobacco as the great seller of baseball cards and the Goudey Gum Company, which produced the Sport Kings set, was leading the way. In the case of the 1933 Sport Kings set, the Goudey Gum Company decided to borrow an idea from earlier T-card sets, such as the highly popular Allen & Ginter cards, and make a set that featured many different types of athletes any hobbyists. This set includes only three baseball cards: #1 Ty Cobb, #2 Babe Ruth, and #42 Carl Hubbell. Football players Red Grange, Jim Thorpe, and Knute Rockne are also featured. The Sport Kings set includes some of the first professional basketball cards ever. The rest of the set consists of ice skaters, hockey players, aviators, swimmers, and even golfers. The Goudey Gum Company also decided to print the card of Babe Didrickson, one of the best female athletes of all time. 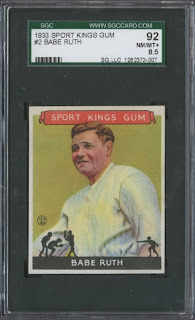 DeansCards.com is lucky enough to have the #2 Babe Ruth card in an SGC 8.5+ NM/MT+. Although the Babe's great career would be over in a few short years, this is still one of his most desirable cards, as it memorializes him as one of the greatest American athletes. We have never seen this card before in any condition, so we are very happy to be able to find a perfect one.